New Hyundai Sonata launched starting at Rs. 18.52 lakh! Hyundai has launched the 2012 Sonata starting at Rs. 18.52 lakh for the manual variant and Rs. 20.61 lakh for the automatic variant. 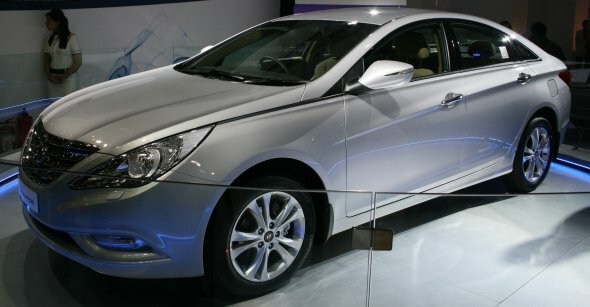 Hyundai showcased the Sonata at the 2012 Delhi Auto Expo. The Sonata is the biggest Hyundai sedan that wears the company’s fluidic design language and demands immediate attention. The Sonata is powered by the 2.4-litre GDI (Gasoline direct Injection) petrol motor with Dual Continuously Variable Valve Timing (D-VTVT). The engine puts out 198 bhp (201 PS) of power and 250 Nm of torque. “The all new Sonata powered by our GDi engine offers best-in-class features. Competitively priced the Sonata offers a stylish new choice to the premium customer,” B.S.Seo, Managing Director and CEO, Hyundai Motors India Limited (HMIL) was quoted as saying by a news agency. Read more about the Sonata here. The fluidic Hyundai Sonata is available in two variants: a 6-speed manual variant and a 6-speed automatic variant. Both the variants are fully loaded with features such as Airbags (dual front, side and curtain), ABS with EBD, ESP (Electronic Stability Program), rear parking system, rear view camera, auto headlight control, leather upholstery and dual zone fully automatic climate control. With regard to entertainment features, the Sonata gets an audio system with MP3 player, USB, aux-in, iPod connectivity and 6-CD changer, 6-speaker system and steering mounted audio & Bluetooth controls. The automatic variant also gets cruise control and paddle shifter features. The Skoda Superb is one of the hot selling cars in the premium sedan segment. Let’s check out how the new Sonata stacks up against the Superb. With regard to features, both the cars are equally equipped with regard to safety and entertainment. However, the Superb has Hill Hold Control, Hydraulic Brake Assist, Anti Slip Regulation, Traction Control System, Tyre Pressure Monitoring and Electronic Differentia Lock which are not available in the 2012 Sonata. In terms of performance, the Superb powered by the 1.8-litre turbo-charged petrol engine puts out 158 bhp of power while the Sonata’s 2.4-litre motor puts out 198 bhp of power, making it more powerful than the Superb. Skoda does offer the Superb powered by 3.6-litre V6 motor that puts out 257 bhp of power while there are no other engine variants in the Sonata. With regard to pricing, the Sonata has an edge over the Superb. The Skoda Superb priced at Rs. 19.6 lakh is nearly Rs. 1 lakh more than the Hyundai Sonata. The Accord is one of the consistently selling premium sedans in India and we check if the new Sonata has an edge over the Accord. The Accord is as equipped as the Sonata in terms of safety (6 airbags, ABS with EBD) and entertainment (6-CD audio system with MP3/6 speaker). Both the cars also have cruise control and paddle shifter for automatic variant. The Sonata gets 10-way power adjustable driver seat and 4-way power adjustable passenger seat while the Accord has only 8-way power adjustable driver seat only. In terms of pricing, the Sonata gets a significant advantage. The Sonata starts at Rs. 18.52 lakh, which is Rs. 1.77 lakh cheaper than the Accord base variant priced at Rs. 20.29 lakh. Similarly, the Sonata automatic variant priced at Rs. 20.6 lakh is Rs. 73,000 (approximate) than the Accord automatic variant. The 2012 Sonata is stylish, spacious and offered at a competitive price tag. Ignoring the Hyundai’s small car maker image, the Sonata is an attractive package. « New 2012 Chevrolet Captiva launch in April!